Help. Need to add manual swith to radio. Ok. si I have the big BUS problem with the Business radio. The only way the radio works without interfearing with the instrument cluster and turn signals and so on is by Removing the #7 fuse which is the BUS line connector between the radio and the car, The only problem with this is that the radio becomes indipendant and does not shut off completely when the car is off, The light or clock stay on, draining the battery ! Sooooo.what i want to do is add a switch or button that removed power to the radio manually. like a fuse does. Eather just add a switch line to the POS line of the radio or to the Fuse line that connects the radio to the battery. Any ideas? should i remove the radio and do this manually to the back line? or remove the fuse panel and add it to the fuse line, or maybe even do it to the main radio line to the battery? Is it seperate or is it all connected to a mian battery line? if that is the case than i would haf to do it to the fuse line. The images are examples of the switches. The connection would be just POS/POS and Light(accessories). Last edited by ShaitanCR; 06-24-2009 at 01:11 PM. Reason: add to title for searching purposes ! any ideas or suggestions? does anybody have a sketch on how to connect the switch ? should it be Neg to ground and Pos to the cable that goes from battery to the fuse for the radio ? Last edited by ShaitanCR; 06-22-2009 at 04:02 PM. Would this work ? Placing the switch before the Positive cable from the battery reaches the fuse box ? The Switch would work as A BRIDGE BETWEEN THE BATTERY AND THE RADIO FUSE ! Last edited by ShaitanCR; 06-22-2009 at 05:24 PM. Anyone with any suggestions? I allready removed the Glovebox for easy access to the Fuses. Yikes why not just fix the problem???? JB Eurotech Service "Your Reasonable Dealer Alternative"
I have been looking at solutions for a while now. changing the radio is expensive and if i do i'll just add an after market one. The business radio is not the problem, the problem is the BUS link between the radio and other instruments. If i remove the FUSE for that BUS system than evrything works fine, except the radio is always ON draining the battery, sooo. simple solution, add a kill switch to the radio and eliminate the BUS link fuse for the radio. I have read allot about this issue and the BUS line is what other people with the same symptoms have had. trouble shooting is all i have done. I have worn out all DIY fixes. The radio does read disabled when that fuse is in. the #7 ! and the turn signals don't work, and the seatbelt light stays on, and other things don't work. all of this goes away when i remove the #7 fuse ! I am opened to all options, i really dont whant to hack into the car. but i miss my music ! hmmmm. this is new. can u find that thread for me? I dont even know where to start when you talk about K-bus splice. where are they located? any photos? ok, i read the whole thread and am still a little confused, I am used to working on honda rice rockets and old beat up drag cars where everything is replaceable and not expensive. I don't wanna break something on the beemer and haf to spend a fortune to fix it. where do i go on this link http://www.bmw-planet.com/diagrams/r.../e46/index.htm ?? thanks in advance jbeurotech ! 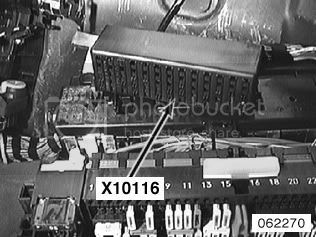 In the link look at signals and find the K-bus you will see a -bus splice(under glove box) it is a comb type connector remove each wire till the bus comes "alive" then you found the issue. Remember K-bus is a 12 volt bus pulled low for signals. OK, signals, signals name with K, K-BUS K bus, I click on it and nothing happens! I have allready seen it when i took out the glovebox and brought down the fusebox ! great... now im stuck. only have IE8 and Firefox3.5 ! soooooo... Ill try from another computer, i think all here at work have IE8 allready. any suggestions? Instead of a switch, couldn't you just attach the wire you were going to add a switch to to an accessory power source? hmmmmm. like what? and how?